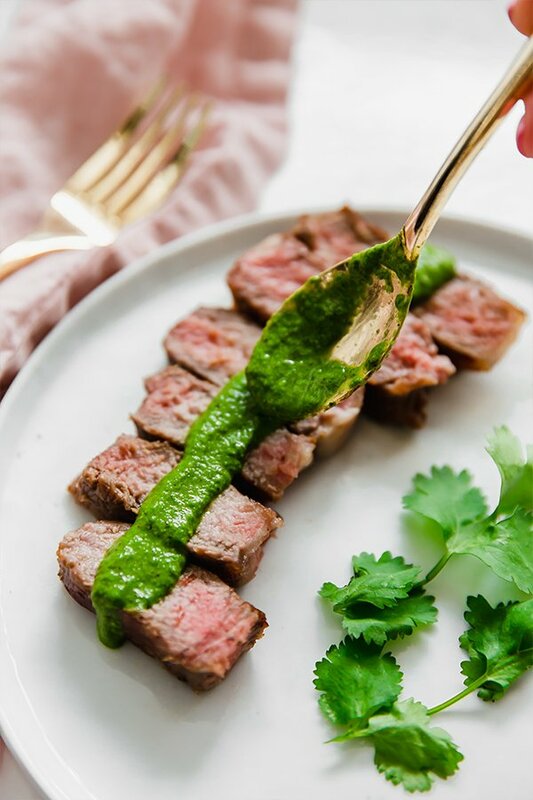 This steak with chimichurri sauce is perfect for serving for date night. It’s paleo, whole30, and AIP compliant. 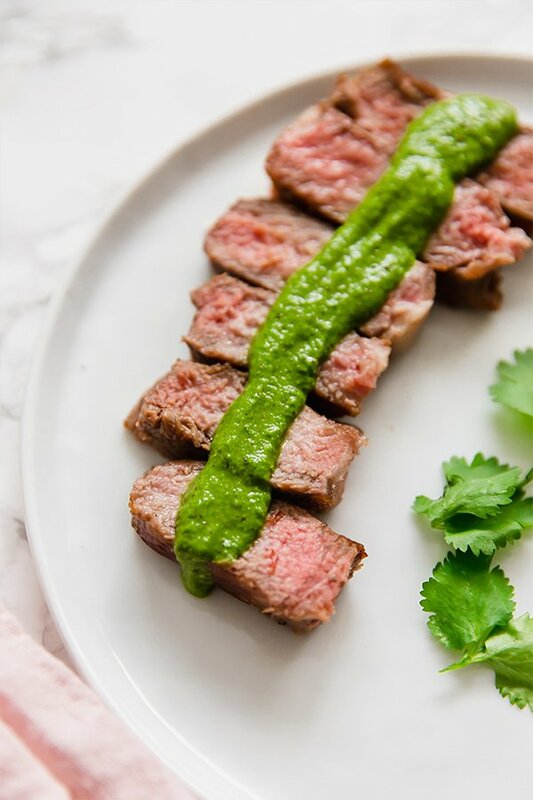 This recipe is the perfect easy steak to make for date night, Valentine’s Day, or just whenever you’re feeling like a satisfying meal! 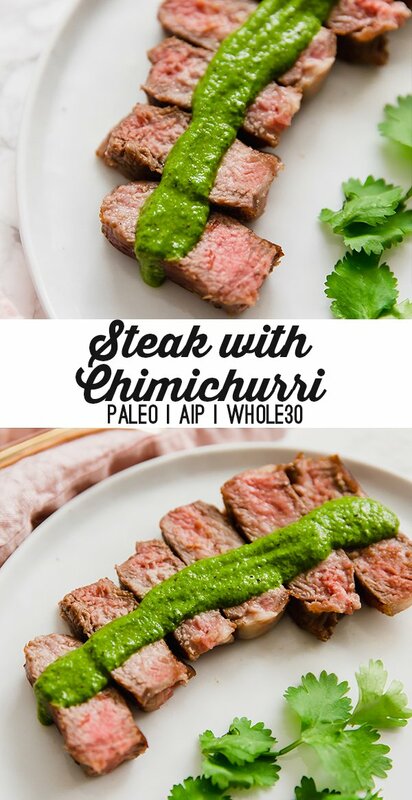 The chimichurri amps up the flavor without adding tons of extra work. It’s an all-around easy meal that looks like you put forth way more effort than you actually did. You can also use rib eye steak or flank steak for this recipe. Avocado oil is a neutral tasting oil that is stable at high heat. This sauce adds so much flavor to the steak! It totally makes the whole dish. Set the strip steak out on the counter for 15-20 minutes to allow to come closer to room temperature. Pat the steak dry and salt well on both sides, along with pepper. Heat the avocado oil in a large cast iron pan on medium heat. Once the oil is hot and shimmering, add the steak to the pan along with the garlic clove. Cook the steak for 3 minutes on each side. Use a meat thermometer to check for the temperature of the desired doneness. See notes. Remove from the pan and allow to rest for 5-10 minutes. 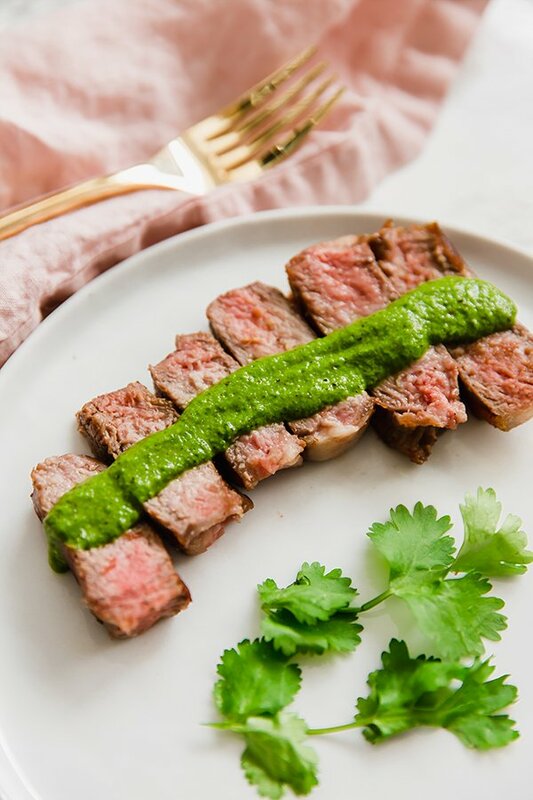 Slice and serve topped with chimichurri sauce. For a rare steak, the temperature should be 130 F-140 F, medium rare if 140-145F, a medium steak is around 150-160F and well done is anything above. Love how basic and simple this recipe is! It’s something even I can make! Thanks!